(Natural News) There are three types of politicians that inhabit the political cesspool that is Washington DC. The first type consists of those who actually demonstrate their intelligence on a regular basis by being vocal advocates for liberty and constitutionalism. The second type are the politicians that know how to sound intelligent, but really aren’t. And the third type consists of those who reside in Washington D.C. but really should be spending the majority of their time sitting on a couch being psychologically evaluated. One of the most obvious examples of a politician who falls under the “type three” category is Arizona Senator John McCain. McCain, who will be turning 81 this August, is considered by most conservatives to be a RINO, or Republican in name only. In the past, he has made several statements in support of the idea of man-made climate change, and he once referred to the Republican Party’s more conservative members, such as Ted Cruz and Rand Paul, as “wacko birds.” More recently, McCain has sided with the Democrats and the liberal media, and compared Trump’s firing of James Comey to Watergate. 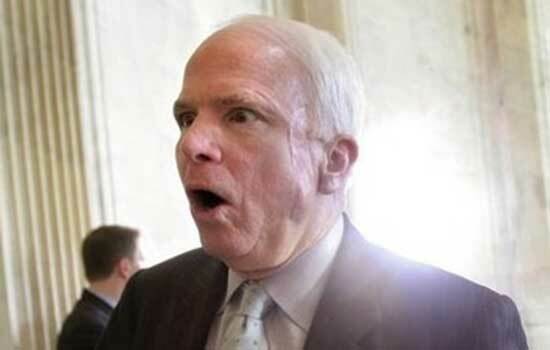 But it isn’t just political knowledge that McCain lacks; indeed, many are beginning to question if the Arizona Senator still has the mental capacity to serve the American people in Washington D.C.
During former FBI Director James Comey’s hearing yesterday before the Senate Intelligence Committee, John McCain’s line of questioning was, in a word, nonsensical. “You reached that conclusion as far as Secretary Clinton was concerned, but you’re not reaching a conclusion as far as this administration is concerned,” McCain said, evidently trying to draw some kind of a distinction between the Clinton email scandal and the Russia investigation. Comey was then forced to explain to McCain that the two probes were not related to one another. Not long after the end of the hearing, McCain issued a statement in an attempt to explain himself, but sadly, the 80-year-old Republican only made things worse. “I get the sense from Twitter that my line of questioning today went over people’s heads. Maybe going forward I shouldn’t stay up late watching the Diamondbacks night games,” he said. The Senator then went on to try to explain the point he was trying to make during the hearing, but even his follow-up explanation demonstrated that he still didn’t really understand what was going on. Of course, Lindsey Graham is a male, yet Justice Ginsburg threw him into the category of “women of the Senate” along with Senator Dianne Feinstein. This past March, Ginsburg celebrated her 84th birthday. If nothing else, John McCain, Nancy Pelosi and Justice Ginsburg are all perfect examples of why the United States should add a term limits amendment to the Constitution. There comes a point where you no longer have the mental capacity to properly serve the American people, and it’s clear that some in Washington D.C. have already reached that point.